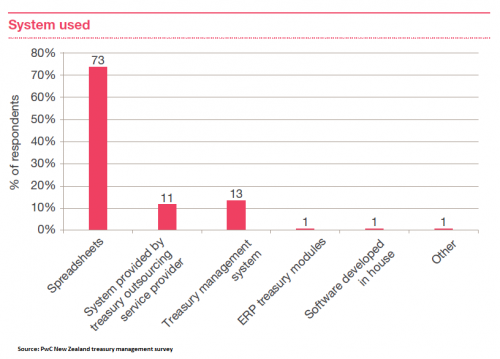 PwC’s recently released “New Zealand treasury management survey” (http://pwc.to/1DCSdse) threw up some interesting results, especially in relation to treasury management systems. It may come as no surprise to many, including us at Hedgebook, that there is a significant number of corporates who are still relying on good old spreadsheets to manage their treasury risks. In fact a whopping 73% of those surveyed still use spreadsheets, with only 13% using any type of treasury management system. Admittedly the 73% is mainly concentrated in small to medium sized organisations, however, the relative risks are the same for these business as they are for larger ones. The key difference is smaller businesses cannot afford, nor justify, the $50k plus price tag associated with these complex systems. Therefore, it is not surprising that one of the main reasons for the high proportion of spreadsheet usage is price. However, as PwC pointed out in their survey, with low cost, cloud based systems entering the market, the excuse of treasury systems being too expensive is fast disappearing. We would also argue that a lower cost system does not have to mean loss of functionality. Again as PwC’s survey showed “executives want detailed information in a timely, up-to-date, reliable and relevant manner.” This is becoming increasingly difficult to achieve with spreadsheets, as reporting requirements become more focused on information to make better decisions, as opposed to information for information sake. Hedgebook certainly fits the bill of a low cost solution, not only providing the ability to better record, report and value treasury risks but also providing unique analysis combining cashflows, hedging and current market rates to help make better hedging decisions. It will be interesting to see these same survey results this time next year. – we may start to see a significant change.